Fall is here. All the leaves are changing, the air is crisp in the morning, and it's getting darker earlier every evening. The imminent approach of autumn obviously means that summer is pretty much over. This also means my creativity to continue using the endless supply of zucchini is also over. Just done. The crazy thing is that this wasn't even as bountiful of year for zucchini as it usually is. 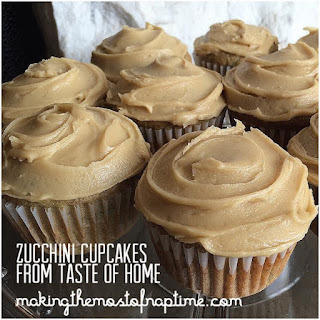 Still though, I felt like I was just out of zucchini ideas. Luckily, I'm trying new recipes a lot more now. I have been a Volunteer Field Editor for Taste of Home magazine for a little over a year now, and part of that role is to review several recipes each month from the thousands to choose from, and submit my own, original recipes several times per year. It has been a fun hobby for me, and fits well with my love of baking and cooking. It's also been a great way to push me to try things that aren't the "old standby" recipes that I always make. So, naturally, my search for recipes always begins now at Taste of Home. 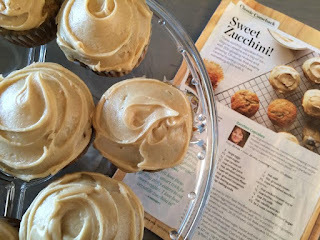 That's where I found this little number..... behold the Zucchini Cupcake! This is definitely a keeper. You will find the original recipe HERE. I loved everything about this cupcake. The consistency of it was nice and moist, and very cake-like. I loved that because sometimes I find baking with such a moist vegetable can make the end product seem dense. However, what really set the cupcake apart for me was the icing. It's not quite caramel....it's not quite maple tasting.....but almost a cross between the two. It's hard to describe.... but it was AMAZING! My only suggestion to make this better? Do yourself a favor and halve the icing portion of this recipe (especially if you're like me and have no shame in eating it right out of the bowl....). Mine were generously iced, and I still had oodles of the frosting left over. Enjoy! Being a Volunteer Field Editor for Taste of Home has also connected me to an incredibly talented group of people with a similar interest: all things food! One of these fine people is Maureen, from Red Cottage Chronicles. 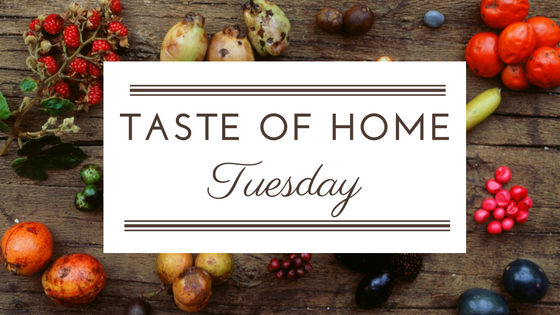 Among many other great ideas, she runs a Taste of Home Tuesday piece on her blog each week, where she features something delicious from Taste of Home. Sometimes other Volunteer Field Editors will join in too. Check it out! I will try and be a part of it occasionally too. Please be sure to visit these lovely VFE's and see what they cooked up this week!